Please forgive. I did not know better at the time. I’m sorry to all of you, for making you believe our intrinsic motivation focuses on factors like Purpose and Mastery. That our Intrinsic Motivation is determined based on making the world a better place or being the best at what we do. 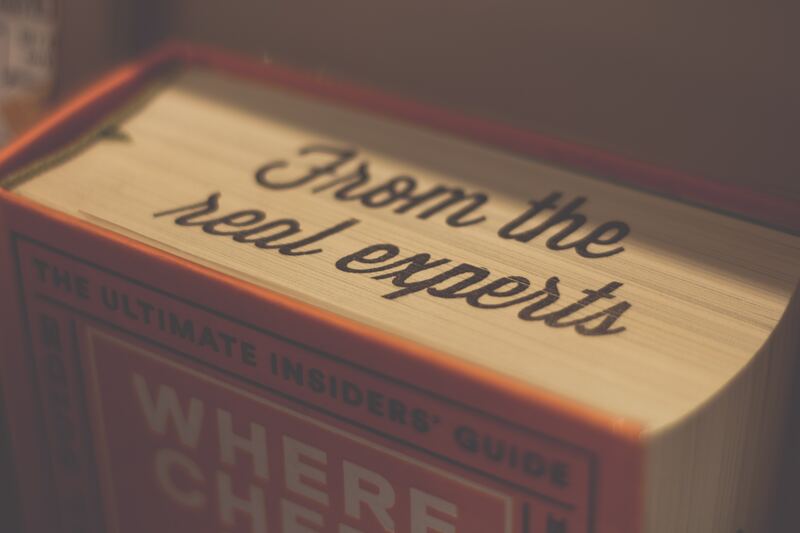 For many years I believed that the terms Purpose and Mastery were actual improvements on the Self Determination Theory, but over the past few years, I slowly started to realize that these terms have distanced ourselves from the truth. It sounds great. Inspiring even, but it’s not true. Even worse, believing that our Intrinsic Motivation is determined by such unrealistic goals, makes us chase something that is in fact, unreachable. But aren’t we motivated by helping the world and being awesome? Yes, but to a much lesser degree than terms like ‘Purpose’ and ‘Mastery’ make us believe. An answer that lies closer to the truth can be found in the original works of Edward Deci and Richard Ryan (Self Determination Theory, 1960). They also spoke of 3 work factors, of which one already sounds familiar: ‘Autonomy’. However, instead of Purpose, the original works spoke of Relatedness. Which meant nothing more than being part of a group. Being able to relate to something beyond yourself. We don’t want to change the world, we just want to be part of it. Next, instead of Mastery, the term competence was used. It was never about being the best at what we do. We just want to feel competent at what we do. Basically just replacing mastery with competence, and purpose with relatedness. After understanding how motivation works and how our industry has forced us into responsive mindsets, I started my search for ways to cultivate a healthy mindset. To create motivational environments. One of my first discoveries was Improv. Important to notice is that it allows us. Improv should never be used to force people to train their soft skills. People who are participating decide for themselves if and which soft skills they will train (mostly unconscious). Unconscious because people already have a vague notion of which soft skills are important to them, and which they like. And because people have an innate drive to learn skills which are relevant to their environment, they will want to develop the soft skills that are relevant to themselves and their environment. During a short Improv Session, you should only do simple Improv exercises and not ask people to perform on stage. In the attached file (see below), those off-limit exercises are called the On-stage exercises. I have created a pdf file with Improv exercises that you can use to organize your own Improv Sessions. Motivation is one of my favorite subjects to talk about. For years I have been passioned about motivation, giving talks and workshops about the subject. 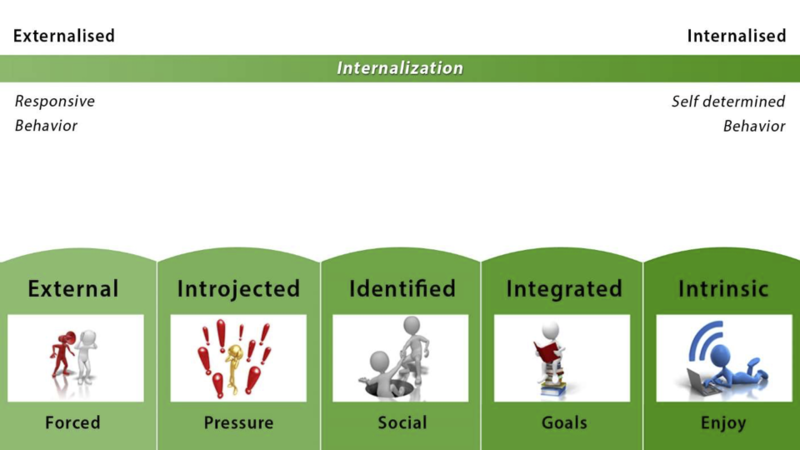 The first model I visualized (and still use a lot), is the internalization model. It originates from the Self Determination Theory. Everything you do is based on a specific type of motivation. It’s the reasoning behind your actions. Quite often we are not even aware of these reasons. Internalized motivation is the polarization at which your motivation comes from yourself, versus an external factor. Highly internalized motivation comes primarily from yourself, and low internalized motivation comes from external factors. Introjected motivation => Pressure. Whenever someone pressures you into something, you are motivated from this level. Salespeople are exceptionally well skilled in using this type of motivation (usually called manipulation) to get people to purchase. Identified motivation => Social. The motivation to do something for someone you care about. Doing the dishes for your partner is a good example. Integrated motivation => Goals. Anything that you personally would like to achieve, but haven’t achieved yet. The internalization is high here, but you are still depending on something you haven’t accomplished yet. Basically, any skill that you want to learn. Intrinsic motivation => Experience. And eventually, the motivation level that everyone talks about these days, Intrinsic Motivation. Intrinsic Motivation only occurs when you don’t care about a specific outcome. The experience of doing it is rewarding enough in itself. At work, these five levels are constantly used by colleagues and companies. Few people realize what the effects are. The internalization determines for a large part how we behave. Fully externalized motivation leads to responsive and passive behavior. People who are used to being pressured or always expect rewards or punishments will mainly respond to those specific stimuli. Whenever these stimuli are absent, these people show passive behavior. We have taught them to only act when we want them (through our external motivation). Many organizations are still showing these problems, where employees show responsive or passive behavior. But that’s not because they want to, it’s because our industry created that type of behavior! On the other hand, Intrinsic Motivation leads to proactive and self-determined behavior. People who understand why their contribution is important, will fight for the companies vision and find new ways to realize this vision while making use of their own skills. 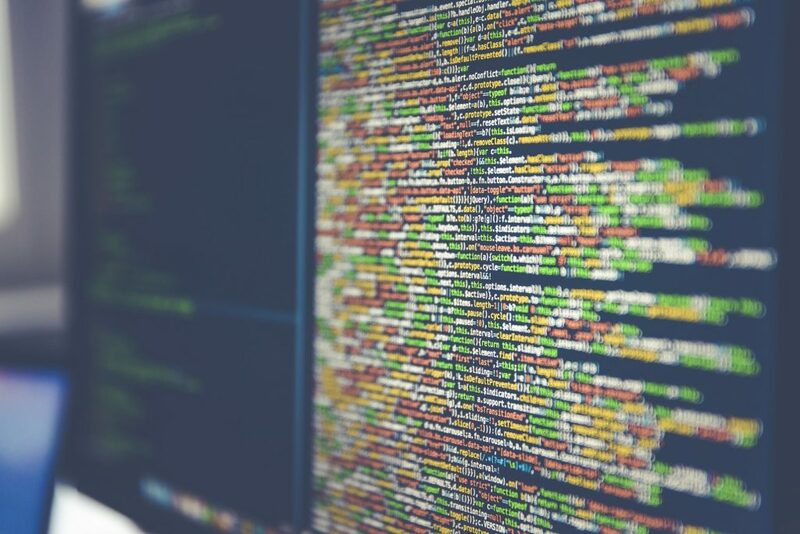 Methods like Agile (slowly even entering non-ICT departments) are highly dependent on Intrinsic Motivation, but there is still little awareness of how this works. And we cannot even influence employees based on Intrinsic Motivation (if we could influence it, it would not be intrinsic anymore). 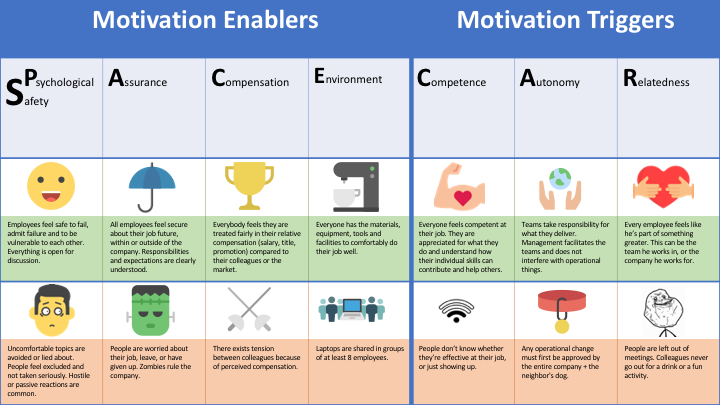 Fortunately, we can use Integrated Motivation to motivate employees. By making employees understand what the vision and the purpose of a product and company is. We need to make them understand how they as an individual can contribute to our vision. The most dangerous thing about extrinsic motivation is that it overrules already existant Intrinsic Motivation. Take painting for example… Painting is an activity that most children like to do for fun. Research shows that when these children are given external rewards – they are given money – these external rewards will slowly overrule our already existent Intrinsic Motivation. Over time, there will be no Intrinsic Motivation left. At that moment, these people will only paint when they are being forced or pressured. Their Intrinsic Motivation has been completely overruled. Over the last decade, another experiment has been conducted over and over again, called: ‘The Candle Problem‘. This experiment uses a puzzle, which can only be solved by thinking out of the box. Two groups are presented with this puzzle. Group 1 hears that the fastest person to solve this puzzle gets a reward in the form of prize money. They are being motivated externally. Group 2 doesn’t hear anything. They will just solve the puzzle using their own motivation. And over the years, the result has been the same: the group that does not receive money is faster in solving this puzzle. Conclusion: People who do not expect an external reward, are better at solving complex puzzles. One of the most important concepts that I focus on being a romanticist, is meaning. It’s a term that is difficult to describe using words, but nevertheless carries great weight wherever we go. A job with little meaning is demotivating for most of us. A job with meaning can give you the energy to get out of bed with a smile on your face. If you – like me – want to create a positive work environment, it’s important to create meaning (for yourself and for others). Things don’t magically gain meaning just by being present. We give meaning to these things, whether they are people, pets or a car. We give them meaning by spending time and energy on them. If you talk a lot to your pet and cuddle with it, they will gain meaning to you. If you bake and bring cookies to work, work itself will gain more meaning to you (because you spent extra time doing something for work). The great thing is that your colleagues will also add meaning to you if they eat your cookies. A task that you finish as swiftly as possible, will have little to no meaning to you. If you prepare a grand entrance on your first day on the job, you will gain meaning to everyone present. If you spend half an hour chitchatting with colleagues each day, you can create meaningful relationships at work. Unfortunately adding meaning will take time. That’s why it’s important to decide for yourself what you want to spend time on, and on who. Because based on those decisions, your environment will automatically gain meaning to you. One of my teachers once taught me about the ‘kill your darlings principle’. It’s about what happens if you unintentionally spend a lot of time on anything, and gain an emotional bond (meaning) which makes it difficult to do the right thing. Which is quite often: destroy your old work and start over. When I was developing my first website, I spend way too much time finetuning all these useless features. I learned a lot from those self-made challenges and it was a lot of fun. However, this website gained a lot of meaning to me. But it wasn’t good (since it was my first). It can be pretty devastating to put your old work aside and start on something new. This is what kill your darlings means. We need to train ourselves to let go of everything we fear to lose. Or else we might get stuck in horrible situations. As I explained, it’s pretty easy to add meaning to almost anything. You just spend time and energy on something. But being the romantic I am, I learned the hard way that adding meaning is not good in itself. Meaning will add weight to any kind of relationship you have. If you add meaning to a stressful relationship with someone, this relationship will end up becoming more stressful. If you spend more time and energy on a horrible date, the date will only get more and more horrible. Do you like beer and cocktails? Gather a group of colleagues who like to get a drink after working hours. Are you into sports? Invite a colleague to go squashing. The 8 hours you spend working, don’t have to be filled with ‘work’. I advise everyone to spend some time with other colleagues and do fun activities with other colleagues. This is the best way to add positive meaning to your life. For yourself and for your colleagues. 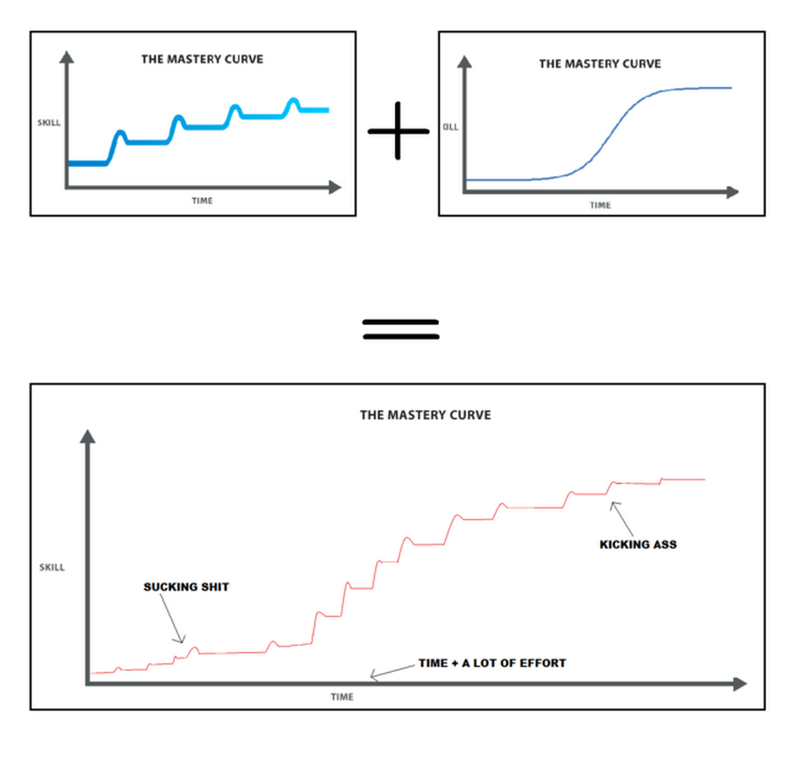 The ‘Mastery Curve’ is a model I picked from game designers. It’s a model to understand the learning curve of players. It’s incredibly important to understand this learning curve in the game industry, or else you might lose an immersed player halfway through the game. A beginning player requires different stimuli than a player who has spent over 100 hours playing the game. That’s why it’s important for the game industry to have a strong grip on this type of motivation. We don’t grow constantly. Occasionally we get an epiphany and everything falls into place. Most of the time we barely grow, sometimes we don’t improve for a period of months. This can be frustrating, but it’s just a part of the process. Time is an essential part of learning. Our learning process is an exponential curve. The better we get, the slower we grow. Eventually, it is impossible to master any skill for 100%. As you can see in the bottom graph, you can get stuck at a certain skill level for a long period (months), but that’s just a part of growing! As long as you don’t give up, you will eventually pick up the pace and continue growing. Whenever you start something new, expect a lot of frustrating moments in which you won’t learn anything. Epiphanies don’t happen on a weekly basis. And remember: if you endure, you might experience your next epiphany and take a huge leap forward. Especially when you start something new, there is so much more to learn. I started surfing several years ago. It was fun at the time, I kept learning new techniques and I slowly got to the point that I could surf a wave while standing up. But after a few years, I got bored. It took too much time before I got another epiphany. Especially since I live in Holland and I barely have the time to go to the ocean. And that’s the main thing, mastering any skill takes a lot of time. I slowly realized that I didn’t like surfing in itself, I just liked the growing aspect of it. And I barely grew anymore. Continuing to surf and getting better at it was getting harder and harder over time. I haven’t even surfed in 2017. There’s a flipside to this. Everyone has these problems and nobody can fully master a skill for 100% (because it’s an exponential curve). As long as you manage to endure and keep training your skills, you could, in fact, get better than anyone else. Do you have someone that inspires you? Someone who is so incredible that it intimates you? Let me tell you: you could beat him/her! After all, even if your role model has mastered a skill for 99%, given enough time you could master the same skill for 99,5%. When was the last time you were working on something and completely forgot the time? You were so immersed in your activity that you actually forgot your next meeting and got there late. This is called a ‘state of flow’. Csikszentmihalyi writes about this state of flow in his book. He describes this as an ecstatic state. Being in a state of flow feels like immersing yourself completely in whatever you are doing. Nothing matters, but the task you are focusing on right now. Some great side effects are that the state of flow also increases our happiness and our performance. Whenever we enter this ecstatic state, we are more capable of solving the complex problems we are facing on a daily basis. Requires an above average skill level. Has an above average challenge level. The challenge level matches your current skill level. Anxiety. 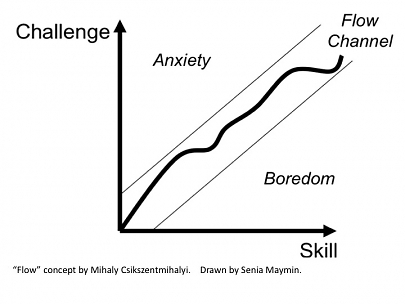 When you are working on a task of which the challenge level is too much for your current skill level, you will experience anxiety. Over time you will experience pressure and stress. If you continue in this state for a longer period, this could even lead to physical complaints like a burnout. Boredom. But if you work on a task which is too easy for you, you will get bored. The most direct consequence is that you will start making mistakes, simply because you don’t take your task seriously. But over time this could also lead to demotivation because you stopped learning new things. But there is one other thing that can break your state of flow: distractions. Getting in a state of flow takes time. For a normal person, it takes around 20 minutes to reach a state of flow. So every time you get distracted by a phone call, WhatsApp message or a colleague with a question, it will take time to get back into this state of flow. Unfortunately, we are subject to distractions a lot throughout a day. Disable notifications of emails and WhatsApp messages and only check them when you have time. Use the rubber duck. Place a rubber duck on your desk whenever you are trying to get into a state of flow (and let your colleagues know you are not to be disturbed when the rubber duck is present). Whatever you are working on, try to enter the state of flow. It will improve your happiness and performance. Introducing the Space-map! 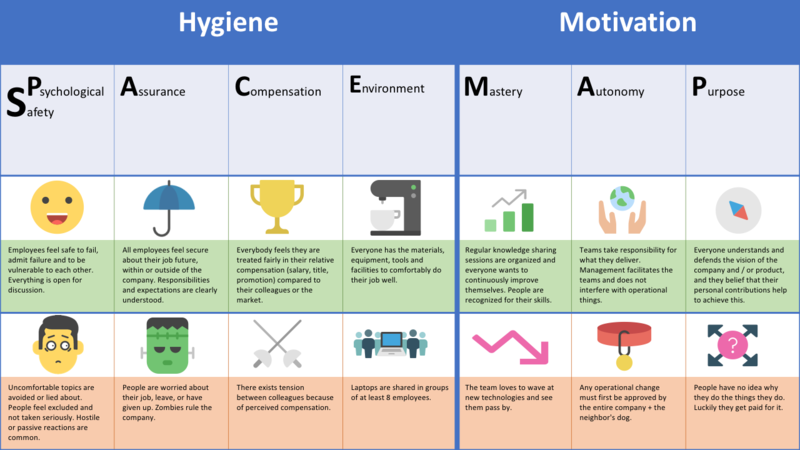 A ‘map’ to gain insight into motivational problems within an organization/department, so that coaches and managers no longer have to talk about vague motivation problems, but instead tackling the lack of autonomy within the teams. We want to understand and give meaning to our life (which is our motivation). But we get distracted by hygiene factors. Hygiene work factors are everything that can hold you back. These are work factors that are mainly visible when absent. When absent, employees will complain about these factors. In due time, this can even result in an increase in sick days or a higher turnout in organizations. These work factors are basically what we need before we can be motivated. Ever since Google has researched this subject, there has been enough information about this. So I will be brief and explain this factor as setting a positive work environment where people feel appreciated and safe to experiment and learn. People require (job) security and clarity. Work expectations have to be clear to everyone. When work expectations are unclear, this will make people feel insecure about their job. Are you doing a good job? If you comfortably dare to answer “yes”, you’re probably fine with that part. Job security is important both inside and outside your current employer. Do you have a healthy set of competencies and skills, so that even when you are fired, you can easily get a new job? In that case, the job security at your current employer will become less relevant. This is mainly about honest compensation. Do you make enough money for the work that you do? And do you carry enough responsibility? Compensation becomes a sensitive job factor when you work with people who make more money than you but deliver less value to the company. Or colleagues with a higher function title, with little understanding of their own job. Even people you meet at parties and conferences have a big impact on whether you feel fairly compensated in your day-to-day job. Do you have access to the correct resources and tools to do your job? Do you have your own workplace, or do you have to get up way too early to claim your table, because your manager has heard some nice things about ‘flextime’? Environment is mainly about the things that you need to get your job done in a way that you could be proud of. Do you have access to the right software and a new laptop? Do you have access to printers, coffee, brainstorm rooms, whiteboards with markers? Anything that can help you with your job. Given that we all want a happy and meaningful life, the following work factors can be directly accredited to this goal. We want to grow and become the best version of ourselves. We want to learn who we are, what we can do and what our limits are. As Edward Deci and Richard Ryan say in Self Determination Theory: “People are active, development-oriented organisms who behave to encounter challenges, to toy with danger, to experience more facets of their being, including, at times, pain and displeasure“. Autonomy is the need to be self-directing, to have the freedom to decide how you live your life. The need to be able to do the right thing, the right way. To take control over your life. We want to know how our efforts can have an impact. We want to understand how our efforts can contribute to a greater cause, to something bigger than ourselves. Purpose – What are we doing? And why? This type of motivation is called autonomy and is the subject of this blog post. Autonomy is the need to be self-directing, to have the freedom to decide how we live our life. At work, this could be understood as doing what’s right, instead of what’s expected of you. Autonomy is highly dependent on the other two motivational factors: Mastery and Purpose. Because as we grow more competent in our skills (mastery) and discover what our environment wants to achieve (purpose), we can determine for ourselves what the biggest problems are in our environment, and how we can solve them. And that’s what autonomy is all about: the need to be able to do the right thing, the right way. Autonomy is not just about having the freedom to do things the right way. Because with this freedom, we become empowered to change our environment. But we must never forget the words of uncle Ben: “With great power, comes great responsibility”. And with empowerment, comes responsibility as well. This is a common problem in IT organizations. 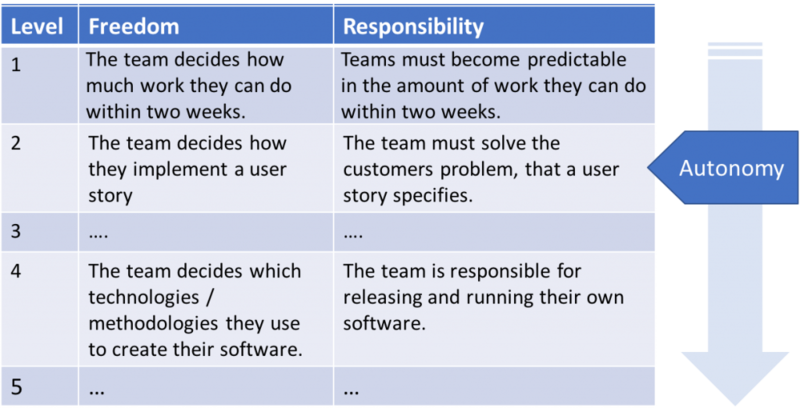 With the rise of Agile, many organizations have given their teams more freedom to deliver great software. When these teams don’t make responsible decisions or fail to live up to expectations, they will lose the trust of their stakeholders, and the company. Autonomy is the most complicated factor in creating a motivational environment. Especially because based on your employees’ mastery and purpose levels, they will require more or less autonomy. The need for autonomy is different per person, but also different over time. And to make matters worse, the person who wants autonomy is never the person who can give it. In most cases, managers are the ones who must provide the right amount of autonomy for their employees. Autonomy Slider with example content in levels 1, 2, 4, and the slider set on level 2. You don’t just give people full autonomy, you gradually increase their level of autonomy, based on how much responsibility they can handle. Every time your employees prove they can handle this and want more, you can increase their level of autonomy, by adjusting the slider. You specify which responsibilities come with a certain freedom. Make sure employees understand how to fulfill these responsibilities (make sure the team understands what you mean with terms like predictable). There is no fixed amount of levels of autonomy, just add new levels as your employees grow. As an employee, you can also initiate the discussion to get more autonomy. As long as you accept the responsibility that comes with it. That’s exactly what we did as a team, in the example I started this blog post with. Make it visible. Whether you use this slider on employees or for entire teams, make sure the freedom and responsibilities are visible to them at all times. Management facilitates. With employees gaining autonomy, the role of management becomes more facilitating and less directing. The time of you telling people what to do will be over. Facilitating is about creating a common understanding of what we want to accomplish and letting teams find their own way to get there. People make mistakes. Whenever people try new things, they will make mistakes. Whenever employees take on new responsibilities, expect them to make mistakes. Don’t try to correct these mistakes beforehand, or else they won’t learn from them. Encourage them to make these mistakes and learn from them. Always remember that autonomy is something that you scale up or down, based on the needs of your employees. And remember that autonomy doesn’t come cheaply, it consists of both freedom and responsibility. After all, autonomy is the need to be able to do the right thing, the right way. The need to be self-determined. As to what happened with the story of the webpage that we rebuild? Two months later, our Product Owner told us how rebuilding this page has reduced the number of calls to the complaints department with 90%! Normal user stories can’t tweak those kinds of numbers, but standing up for what’s right clearly can. So next time you see an opportunity like this, stand up and fight for what’s right! Mastery focuses on being the best at something. Competence focuses on being effective in your environment. The big distinction here is that competence specifies the environment, stating that learning is only motivational if your new skills are relevant in your day-to-day environment. Example: when I give a presentation about cooking noodles at my IT client, I can expect a low turnout. But if I talk about how cooking noodles have helped me understand software code, I can expect a much higher turnout. People will be motivated because they think they can learn something relevant to their job. Innovation Days. One day every 6 weeks, on which employees decide what they work on. As long as they present their newly gained knowledge at the end of the day. Lunch Sessions. Having presentations and brainstorms during lunch. In advance, participants can vote or share their favorite subjects, or movies that they want to broadcast during the lunch session. You could play TED videos for example. Recently I heard about the Morning Study. In which you reserve one hour during each morning (daily from 10 till 11 for example), during which team members have time to read books about their field of expertise, watch TED videos, or debate new practices of work. Ask for and give feedback. Feedback is the primary measurement to discover if what you have learned is relevant in your environment. By giving feedback, you motivate someone to keep/stop behaving in a certain manner. And by receiving feedback, you will discover if what you have learned can contribute to your environment. Try and fail. Experimenting (and making mistakes) is the best way to grow and to learn new things. If you only know the fastest way to the bus stop, you will have little understanding of the area. Perhaps you are even missing out on a spectacular view along the way. Try different approaches to learn new things and to truly understand how things work. So whatever your role in within your company, you can help to create a motivational environment, based on mastery. Just give and ask for feedback, and keep on experimenting. And as for the haunted mansion… our guide was playing pranks on us the whole time to scare us off. But we managed to stay with him until the end of the tour, and then we even watched a nice Phil Collins DVD together. The mansion was beautiful and we got some nice history lessons about the building. As a romanticist, life is all about emotional value. To experience the different facets of emotion. That is what gives my life meaning. A passive, calm day gives me little to no satisfaction. This drives me to make my life as interesting as possible for myself. Unfortunately, this belief also has a dark side. Because it’s about all emotions, including the negative ones, like suffering and pain. To me, these emotions are essential to experiencing the positive emotions. A life without pain and suffering, a life where everything goes the way you want it sounds great at first sight. Everyone would be happy, right? I have serious doubts about that. For starters, I would have trouble sustaining such a lifestyle. If everything turns out good, the term ‘good’ loses meaning, because there is no point of reference anymore. There is no ‘bad’ or ‘wrong’ anymore. And good cannot exist without it’s opposite. Sometimes things have to go horribly wrong, in order for a succesful task to be appreciated. And also, the best things in life, are difficult to come by. Mainly because these things require more effort and usually require failing over and over again. I believe that life requires a certain balance of ‘failures’ vs ‘successes’. Something like 3:1 ratio: for every 3 successes, we need at least 1 failure. Only then my life is truly balanced. Unfortunately, it is difficult to sustain such a balance. We don’t have full control over the number of things that work out or fail horribly. If too much failure occurs, I start to worry and become more careful. I also experience more stress during these times. But if too much goes right, I experience a different aspect of life, called melancholia. While I’m typing this, my burn-out is nearly over. More and more things I do, turn out right. Unfortunately, my desire for sadness grows as well. Quite often I find myself sitting in a bus, observing, and I feel a sudden emotion of sadness come over me. There is no logical reason for this to happen. I simply get sad, because I am being melancholic. It feels like a position of luxury, and that only makes things worse. This troubled me for a long time, but over the years I managed to accept this part of me. Sadness is an important emotion that I require, just to give my life more meaning. Because without sadness, happiness would not mean anything. And that’s what it’s all about, in the end, emotional value.